Richardson is best known for his book In The Early World, published by the New Zealand Council for Educational Research in 1964. The book, an account of his experience developing his child-centred educational philosophy, was widely taken up by teachers colleges both in New Zealand and the United States in the ’60s and early ’70s (a 3rd edition was published last year). Richardson brought a scientific approach to his teaching practice which grew out of an early commitment to experimentation as the basis for developing his own thinking. A childhood immersed in nature on Waiheke Island and 3 years of chemistry, botany and geology at Auckland University had sparked a keen interest in the study of native fossils and fauna. The remote posting at Oruaiti offered him the opportunity to follow his passion for molluscs and to construct his own pedagogy, curriculum and assessment, away from the immediate gaze of both school inspectors and colleagues. 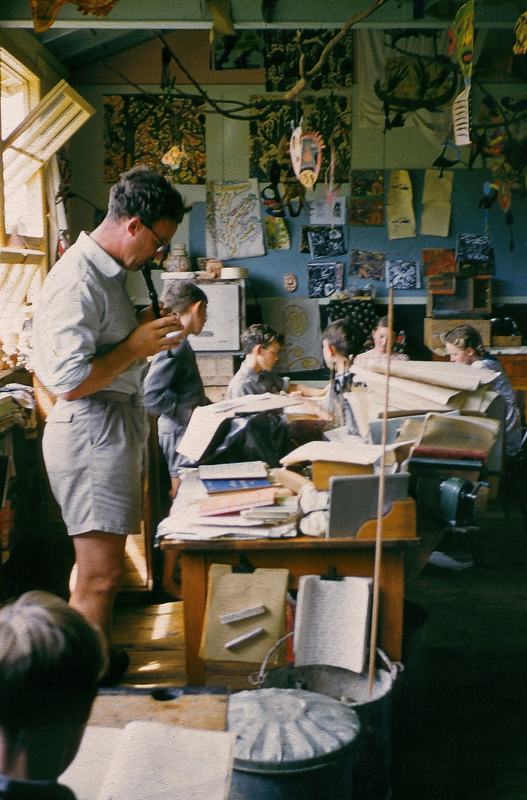 Elwyn Richardson in his classroom, Oruaiti School, circa 1958. During his 12 years at Oruaiti School he won the support of parents from very different religious and cultural backgrounds (mainly Maori and Exclusive Brethren), developed ways of working in a bicultural classroom with students who ranged from 4 to 12 years old, many of whom had English as a second language. He incorporated te reo Maori in his classroom practice, shunned corporal punishment and created a democratic learning environment in which the cultural diversity of his students was respected and celebrated. Richardson discarded the official syllabus and turned instead to the children’s lives and immediate environment for the basis of his curriculum. Using the children’s natural curiosity and interest, Richardson taught them how to look closely at the world around them and to observe and record their new discoveries and their own personal felt responses to these. From here he developed a dynamic and vital programme that was anchored in the children’s surroundings and real lives. Through environmental study the children learned the basis of scientific method, and brought these skills to bear on studies that spanned all subjects. Richardson developed a range of pedagogical strategies to help students internalise discriminating criteria for their expressive work in all media. In time, the children were able to recognise that what was good work for one child might be different in quality from that of another, but that certain criteria such as sincerity, effort and originality, remained the same. A school culture and learning community developed in which sincerity and respect were paramount. Richardson’s students learned to trust their own assessments and to follow their own self-imposed standards while actively contributing to the growth of shared values. Through these methods Richardson developed an approach that facilitated the growth of internal standards that were continually rising, as opposed to the externally imposed fixed standards that are increasingly common in schooling today. Richardson’s work at Oruaiti was followed by brief period lecturing in English at Auckland Teacher’s college from 1961 – 62. He then spent 2 years as Principal at Hay Park School in Auckland, followed by 18 years as Principal of Lincoln Heights School, from 1966 to 1969 and again 1972 to 1987. The publication of In The Early World led to an invitation from the University of Colorado in 1969 to work as visiting lecturer. Over the next 3 years Richardson divided his time between the University of Colorado in Boulder, Bank Street College of Education in New York, the University of Illinois at Urbana-Champaign, the University of Washington in Seattle, and South Dakota State University (SDSU) in Brookings. He returned to New Zealand in 1972 and resumed his position as Principal of Lincoln Heights School until retiring in 1987. Richardson was awarded the Queen’s Service Order in 1989 for his services to education, and received an honorary doctorate from Massey University in 2005. At a time when educational thinking and policy is increasingly dominated by economic relevance, Richardson’s educational approach of reminds us both of the role experimental schools play in contributing ideas of a democratic society while also demonstrating that education can be so much more than the narrowly instrumental. Elwyn Richardson 8 July 1925 – 24 December 2012. AUT has planned an educational symposium to celebrate Richardson’s work to be held in July (contact: janita.craw@aut.ac.nz). NZCER will publish a book later in 2013 based on Margaret MacDonald’s doctoral thesis entitled Elwyn Richardson and The Early World of Art Education in New Zealand. Contact Margaret MacDonald, T: 027 284 1984 W: (03) 353 0951 E: margaretmacd@xtra.co.nz.